Food Blogga: TGIF Foods: Kid-Friendly Lemonade Cookies! TGIF Foods: Kid-Friendly Lemonade Cookies! Lots of kids are back in school already across the country, and they're going to need something to cheer them up this weekend. Forget lemonade stands and soft serve ice cream cones. It's time to pull out the big guns: cookies. 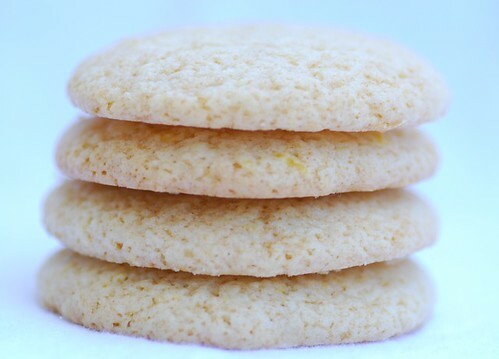 Get the kids in the kitchen and bake a big batch of these sweet-tart lemonade cookies. They're easy to make and can be frosted, an activity universally loved by kids. I first posted on these cookies a year ago, and they're so fabulously fun I had to share them again. Oh, and don't forget to pack a cookie in your little one's lunch box on Monday morning. It may be as healthy as an apple, but it's guaranteed to bring happiness. 1. Preheat oven to 400 degrees F. Whisk flour, baking powder, baking soda, and salt in a medium bowl and set aside. 2. Using an electric mixer cream butter, sugar, and lemon zest on medium speed until light and fluffy. Add the egg, and mix until combined. Alternate adding the flour mixture and the 1/2 cup lemonade concentrate, mixing until just combined. 3. Drop tablespoons of dough onto an ungreased cookie sheet at least 1 1/2 inches apart. Bake for 8-10 minutes. Remove and allow to cool on wire racks for at least 30 minutes if frosting. 4. For the icing: Whisk the confectioners' sugar, lemon zest, and lemon concentrate in a small bowl. Add a few drops of milk and continue whisking until the icing is smooth and opaque and clings to the back of a spoon. Taste it, and adjust flavors as desired. When it's ready, pour icing through a fine mesh sieve to remove any tiny clumps of confectioners' sugar. For easy clean up, place a sheet of parchment paper under the cookie rack before frosting. Dip the top of the cookie in the icing and place on rack. Allow to dry completely before storing in an air-tight tin or plastic container. Place wax paper between layers to protect the icing. Note: The cookies are delicious plain; however, the icing adds an extra layer of tang that'll make you pucker. My only caveat is that icing on cookies prefers chilly winter weather to hot summer weather. So if you ice them, be sure to let them dry thoroughly in an air-conditioned room. Oh, I hope you don't need to be a kid to have these! They look delicious. I love the way those cookies look. They must have a great texture and heavenly flavor! These sound refreshing Susan! !Thanks for reminding us to add them to our lineup! Lemonade cookies sound so creative and delicious! I'm afraid I wouldn't share these cookies with anyone. These would be all for me. I love lemon cookies, and these sound fantastic! Lemon cookies are one of my favorites. I'm going back to school on monday and I think I definitely need these to get me through this weekend. Off to the kitchen! I love anything lemon flavored. These look delicious. I like the name of Lemonade cookies. Thanks for the recipe. rosa-Thanks so much! I love the bold lemon flavor. jacqueline-Don't you hate it when you don't have an ingredients after you're all psyched about making a recipe? ann-I love lemon anything too! teachercooks-Me too. They're never too sweet. joanne-See? Already you're feeling happier! cityshare-I love the name too. It's just so happy. These sound great! There's just something about lemonade concentrate that really gives things a sweet tart flavor, and is more reminiscent of childhood than just lemon juice and zest. I bet limeade would be interesting too...maybe with a bit of Grand Marnier in the icing? It could be a margarita cookie--but perhaps no longer suitable for lunchboxes.